For a while I’d been hearing people rave about Norwegian band Kvelertak. I listened to them a little and thought they were pretty good, but as always I was distracted by other things and never really gave the album a proper in-depth listen. Then I saw them live at Wacken 2011, on the Bullhead City tent stage, and holy crap, they were amazing. So much energy. The tent was packed – despite arriving in plenty of time, the band was well into their second song by the time I got through security. Trying to explain their sound later, I told a friend they were like Baroness (the John Baizley artwork enforces the connection), only about twice as fast and 40 times more intense. That’s no discredit to Baroness either, because they’re a band I really get into. Then I saw them a second time, at Summer Breeze, also inside on a tent stage, and again I was blown away. Vocalist Erlend Hjelvik runs round like he’s unhinged, climbing the lighting stacks and diving into the crowd. Having three guitarists in addition to a bass player, there’s a lot going on all the time on-stage. Outstanding entertainment. There’s a special edition of their debut album coming soon, with bonus tracks, live recordings, a documentary etc – and also extended artwork. If you want to see some of the track-specific images that John Baizley did for this re-release, check out his blog – they look awesome. And just in case that’s not enough Kvelertak-worship for today, they also have a new video, for the track Blodtørst (which translates as “Bloodthirsty” according to my sources, aka the internet). It features some lovely disembowelling and other violence – of the animated variety, that is. The embed won’t work here for some reason, but you can check it out on the Metal Hammer site. 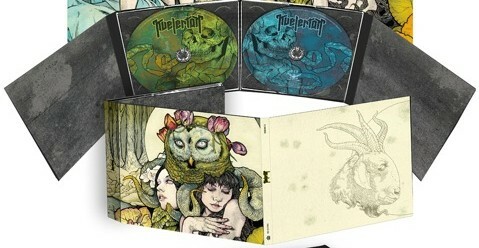 So anyway, Kvelertak – check them out. And if you can’t see them live, go watch some YouTube, because it’s their live energy got me in. ~ by goat_admin on September 21, 2011. I don’t get it. I’ve heard them, I’ve seen them. They bored me shitless. Am I the only person alive who isn’t drowning in Kvelertak worship?